A current exhibit at theVitra Design Museum in Weil Am Rhein, Germany, shows approximately 40 houses from around the world in film, photos and models, illustrating the diversity and ingenuity of what is created from mud, bamboo, straw, cow dung, macerated juices and palm stems. The exhibit, Learning From Vernacular (through September 29, 2013), also shows new construction in modern cities that was inspired by these traditional techniques. 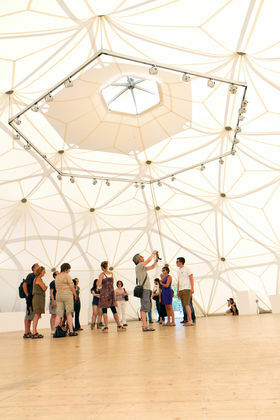 The exhibit itself is housed in one such example, designed by architects Richard Buckminster Fuller and T.C. Howard.